The pride of Lakewood Ranch sits majestically in the midst of the master planned development’s verdant rolling greens and prime real estate properties. Lakewood Ranch Golf and Country Club is a magnificent model of Italian-inspired architecture, patterned after Sarasota’s own Ringling Museum of Art. The clubhouse is located on Legacy Boulevard, surrounded by vibrant green fairways and a scattering of pristine lakes. Upon entrance to the elegant grounds, country club members are immediately enraptured by the stunning aura of 1920s elegance. The imposing grand lobby branches out to several formal and informal dining rooms, including the Grille, Patio, and Wildwood Cellar, card rooms, and a grand ballroom for weddings and charity events. Of course, what is a country club without golf and tennis? Lakewood Ranch Country Club offers a total of 18 lighted clay tennis courts—16 Har-Tru and 2 classic red—that use the highly advanced HydroGrid irrigation system for superior maintenance; hence, optimal play is guaranteed all the time. Facilities include locker and shower rooms, as well as a pro shop. Hungry players can take a break at the Players Club Deli and savor some home-made pizza or the highly recommended lobster bisque in front of a 50-inch TV. At the Athletic Center, just a few steps north of the Tennis Center, visitors can enjoy two outdoor pools. The whole family is sure to have some fun in the sun at the resort-style pool, and serious swimmers can train in the eight-lap Junior Olympic pool. Moreover, the 13000-square-foot Fitness Center provides state-of-the-art Cybex cardio and strength equipment, along with personal trainers to assist members with their workout regimen. Special fitness programs, such as aerobics, spinning, yoga, step, and Pilates are also offered, in addition to soothing massage services that will do wonders to the body and refresh the spirit. As well, members may use the sauna and whirlpool. 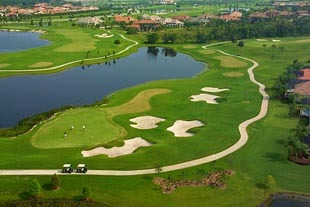 Golf is a priority at Lakewood Ranch Country Club, which boasts of three 18-hole, par 72 golf courses. Two of the courses, Cypress Links and King’s Dunes, were designed by “The King” golfer Arnold Palmer and eco-friendly golf course designer Victoria Martz. The third, Royal Lakes, was a product of international golf designer and master planned landscape authority Rick Robbins. All three courses were designed for all playing levels, which can be a breath of relief to beginners and, at the same time, pose a challenging game to expert golfers. Cypress Links was opened together with the private club in November 2001. Teeing grounds have a slope rating ranging from 119 for white to 134 for black. King’s Dunes was opened in March 2005, almost four years later, with a higher slope rating of 123 for white and 134 for black. Royal Lakes was designed for all levels. Beginners can tee at the red marker, which has a slope rating of 109, whereas experts can head for the black tee with a slope rating of 137. Additionally, Lakewood Ranch Golf and Country Club works with Audobon International to help preserve wildlife, especially our fine feathered friends, and their natural habitats. Areas surrounding all 54 holes are installed with regularly monitored nesting boxes as part of the club’s Nesting Box Program. With such grand amenities and elegant ambiance, it’s no wonder that Lakewood Ranch Country Club real estate is much prized in Florida’s southwestern coast. The community along the breathtaking green slopes is a perfect complement to the elegant lifestyle that is highlighted by its posh country club. There are several residential models to choose from, from stylish single family homes to luxurious estates covering over 6000 square feet of living space. The price points for Lakewood Ranch Country Club homes for sale suit a wide range of budget and lifestyles. The units at Wexford have floor areas of approximately 1500 square feet, and prices start at the mid $200s. Meanwhile, maintenance-free villas at neighborhoods like LaCantera peak at over $1 million. Lakewood Ranch Country Club homes for sale are built along the fairways of the three golf courses, providing residents with tranquil views of the gentle slopes and a splendid vista of the shimmering lakes and thick nature preserves. Stroll through winding nature trails and enjoy green living at its finest. For commercial needs, Lakewood Ranch Town Center is to the east of the community and holds an abundance of retail and gastronomic delights for the residents. 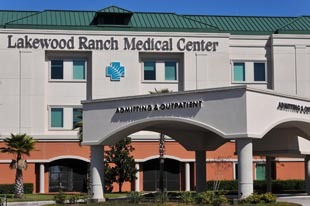 Across Main Street is the Lakewood Ranch Medical Center, a 120-bed acute care hospital with over 400 physicians and healthcare professionals providing integrated in-patient and out-patient services to the villages and surrounding areas. With such an integrated community offering the best options for prime residential living, it’s difficult to find an excuse not to own a Lakewood Ranch Country Club real estate. In fact, the only problem that might plague a prospective buyer is which property to choose from all the excellent models. In this case, it’s best to examine your needs so you can decide on a suitable home for your family. Below are all of the current real estate listings available for sale in the Lakewood Ranch Country Club.